Bite-sized: The buttery, lemony shortbreads are a perfect antidote to winter gloom. Photo by Pradeep Gaur/Mint. So MasterChef Australia is drawing to a close and the long winter evenings stretch out before us without Gary, George and Matt to keep us warm. How will we cope? For the past few months, millions of us have been glued to every moment of the 24 hopefuls’ journey from enthusiastic home cooks to sous-vide ninjas. We’ve laughed, we’ve cried, we’ve howled at the injustice of Hayden being voted out. Our social lives have taken a hit, but at least we’ve started “plating up" the children’s tea, and every meal has become an invention test. Some of us are even talking in bad Australian accents (okay, that might just be me). I attended a dinner the other night in honour of one of the show’s chefs, Christine Manfield, and the guests (a fairly A-list Delhi crowd) were positively fawning. One local celebrity was seen begging to have his photo taken with her. The only downside is that 60 minutes of staring at all that food can make you a bit peckish. Some may see it as a cue to get in the kitchen and experiment with some molecular gastronomy. Personally, I reach for the biscuit tin, but this is one situation where a pack of Parle-G just won’t do. (Clockwise from from top Left) Use good-quality butter; bake for 30-40 minutes; cut out the cookies while still warm; and let them cool before icing. Photographs by Pradeep Gaur/Mint. Preheat the oven to 160 degrees Celsius. Line a baking tin, approximately 30x20cm, with non-stick parchment paper. Sift the flour, icing sugar, rice flour, lemon zest and salt into a large bowl. Add butter and rub into the dry ingredients until it is evenly distributed. Because there is so much butter, you will end up with a soft, slightly sticky mixture. Gently knead the mixture into a smooth ball on a lightly floured surface, then place on the parchment paper. With a rolling pin, or even fingertips, press the mixture to fit the baking tin. Make sure the shortbread is evenly spread and smooth on top. Bake for about 30-40 minutes, until the shortbread is cooked but still pale. 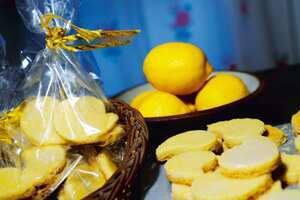 To make the icing, mix the icing sugar, lemon zest and lemon juice until smooth. 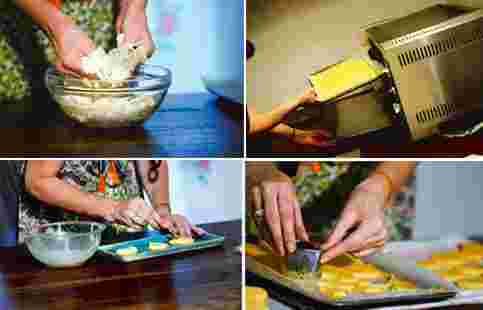 When the shortbread is baked, remove from the oven, and while it is still warm, cut into shapes using metal cutters or simply cut into bars with a knife. Lift the biscuits out of the tin and leave to cool on a wire rack before glazing the tops with icing. *Shortbread is a great biscuit to give as a present because it stays for a couple of weeks. At home in Scotland, it is a traditional New Year, or “Hogmanay" gift.